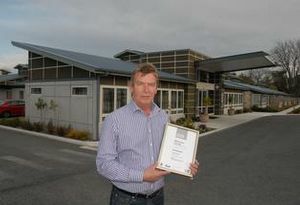 Wairarapa workmanship has won silver at the Registered Master Builders Commercial Project Awards. Project manager Bryce Jolliffe, who prefers to call the building an aged-care facility, said Glenwood took 12 months to construct and cost around $6 million. It is sited in the Masonic Village off Upper Plain Rd on Masterton’s west side. The building is made of precast concrete panels, and shadowclad ply with aluminium battens. “They wanted something low-maintenance,” Mr Jolliffe said. At the height of construction, up to 40 builders were employed, mostly from the Wairarapa area, along with plenty of local subcontractors. The facility houses 42 residents in single or double bedrooms with en-suites, and there are kitchen, laundry and administration provisions, as well as large and small communal areas. The building is so shaped that each unit opens on to one of several courtyards. Inside, the building is adorned with macrocarpa trim and doors shaped by Rigg-Zschokke’s own joiners and milled from the three-section residential site that was purchased for the project. Rigg-Zschokke topped the health section of the Registered Master Builder’s Commercial Project of the Year.